Q&A: Ernesto Padilla, Owner of Padilla Cigar Co.
Ernesto Padilla is the owner of Padilla Cigar Co., a cigar company launched in early 2003. He started his business as a way to honor his father, the late Cuban poet Heberto Padilla, whose writings criticized the Castro regime. In the early 1970s, Heberto Padilla was imprisoned and tortured under Castro’s communist government, causing an uproar in the literary world known as “The Padilla Affair.” Ernesto Padilla recently sat down with Cigar Aficionado assistant editor David Clough to talk about his father, the cigar industry and his company’s 15 years of business. Padilla: I grew up around cigars. My father was a big cigar smoker. He was a writer, a poet. Well known in that world. But he came from a tobacco-growing family from the Canary Islands of Spain. The farms are still there. Their names are still there. So I grew up around that my whole life. My father died in 2000. He was a visiting professor at Auburn University. I was working for ad agencies in Dallas, Fort Worth at the time. But I was looking for something, to create something within an industry that I and also my father enjoyed. And the cigar industry had a craft element; it was artisanal. I worked a little bit in the marketing department at Tabacalera Perdomo. I knew nothing about business—I still don’t. But I started Padilla Cigars in 2003. Q: Your father’s family grew tobacco in Cuba? A: He was born in Pinar del Río. His family owned land and they grew tobacco there. There’s a book he wrote where he talks about it, saying, “I remember going with my grandparents feeling the stickiness of tobacco in our fields, taking it to our curing barn, taking it to market in Havana.” So it was very much a part of his life. And the reason he became a writer was very much connected to cigars. Q: What was the first cigar you ever smoked? A: It’s easy to remember because it had the Cohiba label on it. It was my dad’s Cohiba. I was probably in middle school. I stole one, my parents went away, I went up to the attic. And I turned green. Then after that, I smoked some cigars with him, my dad. That’s how I got into cigars. Q: What did your dad smoke? A: When he lived in New York, I remember, he used to smoke Te-Amo, that was a big brand. That was a huge brand. I asked him one time, what are you smoking, and he goes, “What do you mean? There’s only one thing to smoke. Te-Amo.” That was the brand. Q: How have you seen the cigar industry change over the past 10 years? A: Online. Internet retailers. This industry decided to do what the record industry did—which is to fight technology. The only thing that’s changed since cigars were invented is not cigars—but how they’re sold. So unless you realize there’s a whole new world, you’re just going to be a dying breed. In the past there was a stigma of selling online and now it’s completely different. People are still going to cigar stores—it’s an important part of the industry. But Americans have less and less disposable income. Brick and mortars are more expensive for the consumer. Q: And how has the cigar industry stayed the same? A: Everyone still wants to get in and make Elon Musk-level money. Even with FDA regulation, everyone still wants in. And when you ask these guys, “What are you doing about regulation?” They say, “Hope for the best.” And that’s fine if you’re playing golf, but if you’re running a business that’s not a smart way to go about things. You know, every few years you get a really wealthy guy that comes into the industry, starts a business and it’s fun...it’s entertaining to watch because you see free market capitalism come at these guys like a freight train with no brakes, sliding down the hill. And you’re kind of just like, oh, this is going to be fun. Q: How would you describe your audience? Who is the Padilla Cigar smoker? A: The average cigar guy. He’s got a family, he’s got a dog. He makes OK money. He’s not super wealthy. Well, some of them are wealthy. 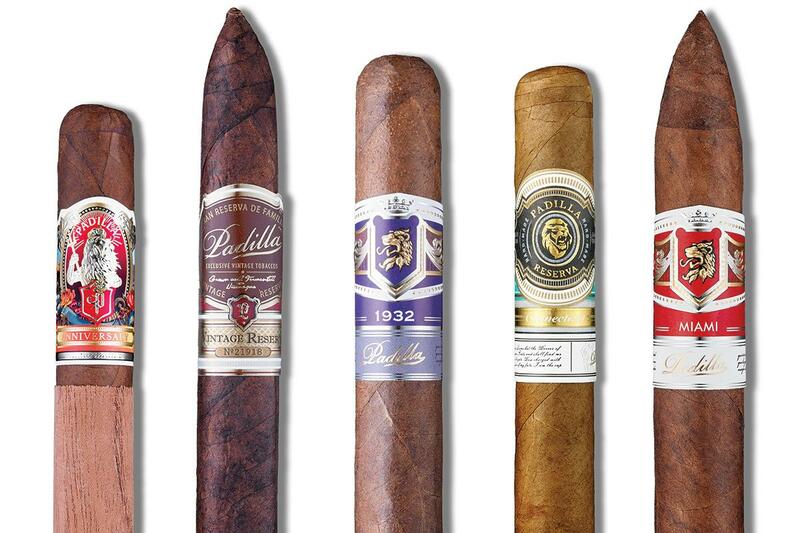 Padilla Cigar Co.'s portfolio of brands includes cigars like, from left, Anniversary, Vintage Reserve, 1932, Connecticut and Miami. Q: How are you handling new FDA regulations? A: We have an attorney for that. If you’re not talking about FDA and you’re selling cigars, you might as well just go jump off a building because you’re not going to be doing it much longer. There are time frames when it’s happening. It’s coming. The regulations. We’re paying the FDA user fees, but there are more regulations coming down the line. Q: How many of your brands are grandfathered? A: We have eight brands that are grandfathered. Padilla Miami, Habano, 1932, 1948, Series ’68, Connecticut, Maduro and Hybrid. Q: How many cigars do you make a year? A: Just one brand, the Padilla Fumas, you see for $1.20 on Cigars International. We’ll do about a million of those. It’s made at Raices Cubanas. What I try to do, all I want—even if its a cheaper cigar, I want it to have some semblance of the other, more expensive Padillas. So the Fumas, for example, is made at Raices Cubanas, it’s a Cuban sandwich. Really not bad. A good yard cigar, play poker cigar. It’s just unbelievable how many of those they sell. But our other brands are still very boutique: Padilla 1932, Padilla Miami. You can’t go into every cigar store in America and find Padilla cigars. It’s hard to define us. All together, Raices probably makes close to two million Padilla cigars a year. Q: What do you consider your high-end portfolio? A: Padilla Miami, 1932, Vintage Reserve, Padilla Anniversary. They’re priced higher, about $10 to $15. Q: Where do you see your company in five years? A: This is our 15th anniversary. When I got into the industry it was pretty stable. But then it was fire alarms—it crashed end of 2008. The recession. It felt like the world was coming down. In five years I hope I’m still here, but I think the cigar industry is going to get better. Hopefully the industry finds stability, gets more professional. I don’t think we, as an industry, fight the tax situation enough. But I think we’re going to find a better, more professional industry in a few years. And it won’t all be fun. It’ll be a shame to deal with a lot of the issues that we have, but I think there are better times ahead than what people think. Q: Do you sell Padilla cigars in Europe? A: Not a lot. It’s not a big market for us. Q: Where do you make your cigars? A: Primarily Raices Cubanas, in Honduras. But I’ve made cigars everywhere, worked with a lot of people. Pepín Garcia, Arsenio Ramos, A.J. Fernandez. But I like working with Hugo Endemaño [at Raices Cubanas]. He uses a lot of his own tobacco, grows his own tobacco. He makes a lot of quality cigars, done the right way, triple capped, rolled entubado. Q: What was it like working with Jose “Pepín” Garcia? A: Pepín makes good cigars. There was a point in time where it seemed like he was the only guy on planet Earth who could make a good cigar. I started working with him around 2005. He was in Miami, in this tiny little place [called El Rey de los Habanos]. I think he had eight rollers. Pete Johnson [of Tatuaje] started working with Pepín right before me. Then everyone wanted to work with Pepín. A lot of people still talk about the cigars I made with Pepín. I have this ghost in my machine, where people will say “Yeah, I smoked a Padilla Miami or a 1932, but it’s not like the old 1932s that Pepín made.” I think this current Padilla Miami, rolled at Raices, is the best one out of all the ones I’ve made. The wrapper is grown in Honduras. The [filler] is Aganorsa tobacco. It’s a great cigar. This article first appeared in the April 17, 2018 issue of Cigar Insider.